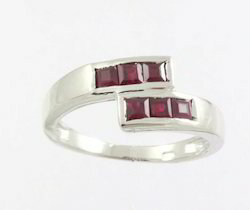 Our product range includes a wide range of ruby ring in 925 sterling silver, semi precious stone jewelry and multi sapphire gemstone ring in silver. Our traditional artisans show their intricate craftsmanship in making Ruby Ring in 925 Sterling Silver. As they are light in color so they look more attractive. Developed and designed by the adroit craftsmen and professionals, these are stylish and are finished immaculately. 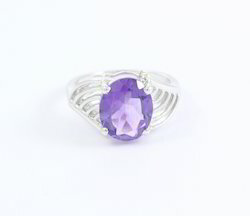 The specialty of our company lies in the offer of Amethyst Gemstone Silver Ring. These are crafted beautifully and are designed making use of good quality material. The shiny and beautiful appearance of this Silver Rings attracts the clients and also increases its demand day by day. Apart from that, this is designed using high quality material by the talented designers. 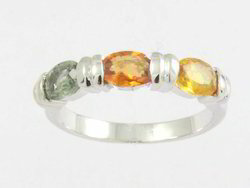 Multi Sapphire Gemstone Ring in Silver is studded with diamond and gemstone. It has 925 sterling silver and 14k gold. We are renowned for providing Silver Ring that are unique in designs and are available in numerous patterns. Made for modern women, Crafted from sterling silver, it is skin friendly.